Hey lovely's, so I got a few updates for you! Then after an outfit review. Let's begin this exciting things! First updates, then the review ;)! 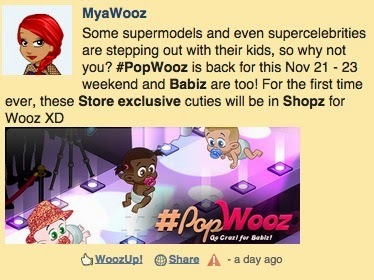 The second update is about supermodels and celebrities stepping on the catwalk with their babiz. 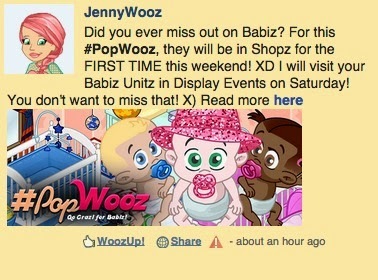 This weekend.. buy your babiz and get the new outfits. #OnPoint! So have fun, and support them for their hard work! Now let's do an outfit review! (: So yeah.. Stay tuned for nowwwwww! "THIS IS A DISATER" -Suite Life of Zack and Cody. 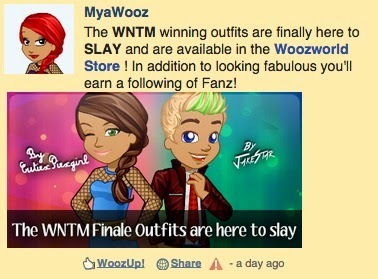 So I'll just like show you Jay and Mya's outfits... because I forgot to crop out Jenny's and I have Max's but it would be awkward if I did 2 boys and a guy outfit.. but ya know its the same anyways. So yeah. Hair: I like the hair and all.. but it really really really looks like the fringe braid.. I feel like she took the hair and changed it into a cuter version and I like it. Dress: The dress is super cute. I enjoy looking at it but the whole fishnet and belt.. and the flowing bottom just don't look good together in my opinion. I think some things could change but it looks original. Shoes: I like the shoes. How crazy they are is just super weird.. and cute. So yeah. Hair: I like the hair. It's spiky and fashionable. So yeah, it's cute! Top: I like how the collar is put upward. The tie and the stripe thing look nice on it. I like it. Pants: I love the pants. How they fit together is cute. I think I would def wear them haha! P.s HAPPY BIRTHDAY TO MAX.